Solid construction and effective in design, the Force USA Tricep Rope is made for everyday home gym use, and designed to fit on any cable exercise equipment. Featuring heavy duty SteelForce™ Structural Integrity, the Force USA Tricep Rope is built to take a pounding and helps you expand your range of exercises. And, with a “Class A” rating, the Force USA Tricep Rope comes with a Lifetime Structural Warranty. The Force USA Tricep Rope is unmatched in its class and will give you solid and intense workouts for many years to come! With the Force USA Tricep Rope you will have intense workouts for a variety of different muscle groups while maximizing the effectiveness of your workouts. 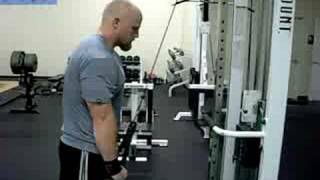 The Force USA Tricep Rope provides some of the best, most effective cable exercises. Mix up your exercises and take your training to the next level! The Force USA Tricep Rope is solid to build a rock solid body! Structural Integrity – Built to last high quality heavy-gauge steel that supports even the toughest of workouts. The Force USA Tricep Rope is to be used for Tricep Pushdown exercises only - It has a maximum weight capacity of 40kg. NOTE: For home use only. Very good, I'm happy with it. We have purchased from Gym and Fitness before and they provide very good service no problems here. However we were disappointed when we opened our delivery today to discover that the Rope Ends were not solid and are plastic not rubber as specified. We could have purchased a cheaper rope from another supplier which appeared almost identical with plastic ends. We chose to order this one because of the reference to solid rubber grips. At the end of the day won't make a huge difference to our training, but we feel that the description should be altered to reflect what you actually receive. Creates tough angle for the tricep, more than a horizontal bar - loving it currently.